There's nothing as exciting as preparing for the birth of a baby. 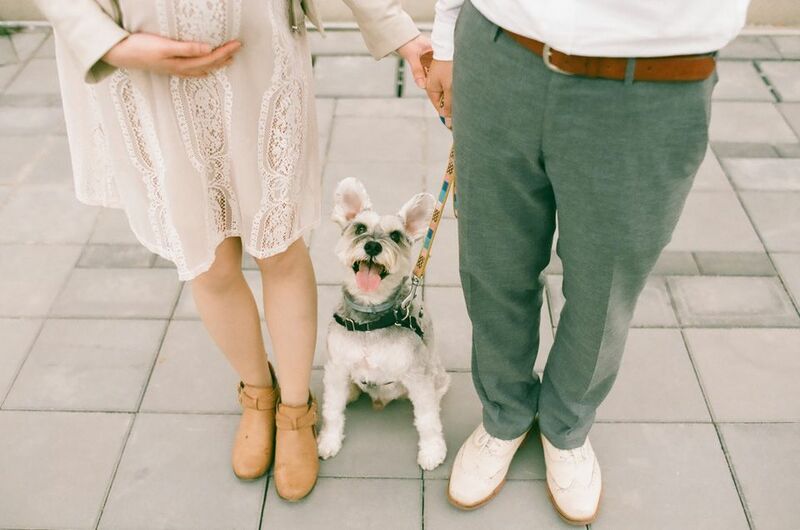 While you're planning the color of the nursery and picking out items for your baby registry, don't overlook one very important step in getting ready for your new baby: preparing the family dog. Your dog almost certainly knows something is going on; aside from the changes to the house, dogs usually can sense hormonal and mood changes in their humans. Don't wait until the baby arrives to get your dog used to the idea of a new person in the house. The more time you have before the baby arrives, the more likely it is your dog will be comfortable with the changes that are about to take place in your home. It can't be stressed enough that you should not delay getting your dog ready for the baby's arrival. You won't have time to handle these changes with a new baby on hand, and your dog will be bewildered. Instead, begin the adjustment period at least a few weeks, if not a few months, before the baby's due date. One of the first steps you should take to prepare a dog for a new baby is to start working on or refreshing obedience training. A well-mannered dog who knows basic obedience commands is easier to manage than one who is out of control. Mastering basic skills now, such as sit, down, and walking on a leash, will make life much easier when you are trying to care for the needs of your newborn. There are several dog behavior problems that can be annoying, or even dangerous when you are caring for a newborn baby. Things such as barking and destructive behavior can be a nuisance, creating more work for you or startling the baby out of sleep. Jumping up or aggressive behavior can pose a real danger to you and the baby. Since these are not problems that go away overnight, start working on eliminating these problem behaviors now. You may want to consider calling in a dog trainer or animal behaviorist to help deal with any of these issues if you think they may persist or get worse with baby's arrival. If you haven't used a crate for your dog in the past, you may want to consider introducing him to crate training now. Even a housebroken dog can benefit from being crate trained. Just like cribs and play yards provide a safe haven for babies, a crate gives your dog a safe place to call its own. He may enjoy having a place of his own to escape from the baby for a while. It also gives you a safe place to confine your dog when you need to keep him out from under your feet. Just remember that a dog should not be crated for more than a few hours at a time. If everything changes at once when the baby gets home, the dog will associate changes with the baby and may feel resentful. Make small changes, like the location of its food bowl or its bed, so the dog can adapt in advance. Many dogs are never around babies until their family brings one home. When you consider everything that comes along with a baby - new sounds and smells, changes to the daily routine, sharing attention - it's easy to see why it can be a confusing and frightening experience for a dog. Bring home baby items like powder, shampoo, diapers and anything else you'll be using on a daily basis with a new baby. Introducing these new smells ahead of baby's arrival will make it less overwhelming for the dog. And once the baby is born, bring home an item from the hospital such as a blanket or piece of clothing to introduce the dog to the baby's scent. There's no question you'll be spending less time with your dog after the baby's born. It may seem counter-intuitive to scale back on the attention you give your dog ahead of the birth; you may want to give him more of your time now since you know there will be less time later. But it's better for the dog if the transition happens gradually, so shorten play time and walks prior to baby's arrival. An abrupt shift in attention could make the dog jealous, and at the very least, will confuse it. Invite over friends and family members with babies so your dog at least has some experience with these small, loud creatures. Another way to familiarize your dog with babies is to play some baby sounds for a few weeks before the real baby arrives.